Can Nvidia compete with AMD's new graphics chips? Has Nvidia got anything that can possibly compete with AMD's new Radeon HD 6000 graphics chips? AMD is currently in launch mode with its second generation DX11 GPUs and the pressure is on Nvidia to respond. For now, Nvidia retains the top spot in terms of single-GPU 3D performance. 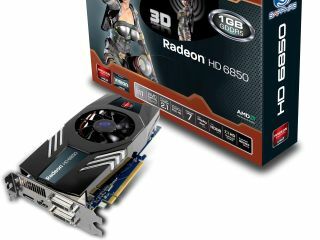 Initially, AMD is not launching the flagship chip of the new Radeon HD 6000 series. Instead, the first GPUs out of the gate will be the Radeon HD 6850 and 6870. And although very powerful, they won't threaten Nvidia's GeForce GTX 480. However, in November the new Radeon HD 6970 arrives. It looks sure to blow the GTX 480 away. How will Nvidia respond? The most obvious answer is simply to release a full 512-shader version of the Fermi chip, aka the GF100, as found in existing GeForce GTX 480 boards. Regular TechRadar readers will recall existing GTX 480 boards make do with 480 shaders. The GF100 packs 512 shaders, but the remainder are disabled for reasons involving power consumption and Nvidia's production yields. Anyway, switching on all the shaders may seem like a no brainer. But here's the rub. It would only add up to a seven per cent increase in shaders. What's more, the impact of enabling those shaders in GF100 is said to be punitive in terms of power consumption. Very likely, it would take any graphics card based on GF100 over the 300W limit required for compliance with the PCI E graphics specifications. Anyway, if the rumours are to be believed, Nvidia's yields are so low it may not have enough chips with 512 functioning shaders for a proper product launch. No, if Nvidia wants seize back the performance crown it so cherishes from the upcoming Radeon HD 6970, it needs a new flasghip GPU. That's exactly what's thought to be coming in the form of a chip currently known as GF110 and likely to be sold as the GeForce GTX 580. At this point, we need to issue a health warning. Even by the usual standards of upcoming graphics chips, the rumours surrounding GF110 are exceptionally sketchy and self contradictory. However, as the codename suggests, it's not a major new architecture, rather a refresh of Nvidia's existing Fermi architecture. The picture of GF110 that most frequently emerges looks something like this. The key feature everyone wants to know is the shader count and the figure that keeps popping up is 512. Yup, the same as the existing GF100. If that seems disappointing, further details provide a little context. The texture count is widely expected to hit 128, more than double the 60 texture units of GF100. The memory bus of GF110 is also for the up, growing in width from 384 bits to 512 bits. What these specifications don't capture is the detail changes Nvidia may make to the chip's internals. GF100 has problems in terms of thermals, efficiency and die size. It's a big old bruiser. Nvidia addressed some of these issues when it shrunk GF100 down to create the smaller GF104 GPU found in GeForce GTX 460 boards. In fact, for GF104 Nvidia made the bold step of chopping out some of Fermi's general-purpose computing capabilities. If Nvidia really wants to maximise performance in the short run, it probably has to do the same thing with GF110. It will be a bit humiliating, given the hype Nvidia attaches to the general purpose computing capabilities of its top chips. But it will make for a more efficient, effective GPU in applications that really count for big GPUs, games. More to the point, streamlining the GF110 might just allow Nvidia to up the graphics performance without breaching that 300W PCI E barrier. After all, Nvidia is stuck with 40nm production technology from Taiwanese chip maker TSMC for the forseeable future. Performance and efficiency gains courtesy of smaller transistors are not available for GF110, in other words. For the sake of completeness, we should also touch on one further whisper doing the rounds. There is talk of a 768-shader GeForce GTX 580. At first glance, a 50 per cent increase in shaders seems impossible in terms of chip size and power consumption. It would simply be too expensive to make with 40nm silicon. But what if the GTX 580 was actually a dual-GPU card? What if it was based on two fully-enabled GF104 chips? It would then sport 768 shaders, as well as the magic 128 texture unit figure that keeps popping up and 512 bits of total memory bus width. It's even possible Nvidia may roll with both products – a quicker high end GPU that might just keep AMD's Radeon HD 6970 honest and a dual-GPU beast designed to be the quickest single card on the market. But whatever Nvidia goes for, the key remaining question is when? The absolute earliest anything new and powerful from Nvidia is likely to appear is December. We reckon an early 2011 launch is more likely, especially if new silicon is involved. Watch this space.